Auction vs Private Sale? Make The Right Decision. Choose An Agent That Matches Your Property. Marketing Advice - Avoid Overspend. Save Time & Worry Less. Work With Somone You Can Trust. House prices are booming and real estate agents are making more money than ever before. However, there is often a huge difference in selling price between auctioning property with a real estate agent and using a Vendors Advocate to sell a property privately. The preferred method of selling for most real estate agents is by Auction. The entire process, from the appointment of the real estate agent to the sale of the property, can take as little as 4 weeks. At the start of the process, the vendor is required to invest in 'marketing' which could cost as much as $5,000. There are many other optional costs including interior design. These costs, as well as the cost of the Auction, make it very expensive to withdraw the property from sale if the vendors selling price is not realised. The process is structured so the vendor is committed to selling the property in a very short period of time. It's easy to see how this process benefits real estate agent, but does it benefit the seller? Informed sellers are increasingly asking this exact question and the answer is often a resounding - NO! Don't get us wrong. Auctions can be good for the vendor, especially in a buoyant market or if the property has a WOW factor. A WOW factor triggers an emotional response and it is often the emotion that results in bidders ignoring their bid limits and bidding more than what they planned. In addition, if managed carefully, selling by private sale can provide you with the opportunity of 'testing' the market before fully committing to a sale. 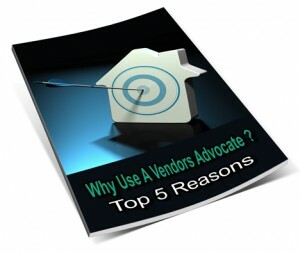 A Vendors Advocate is the perfect person to manage such a process. A Vendors Advocate is perfect for a vendor who does not want to immediately commit to an auction. We are experienced and unbiased. Work with a professional that does not have a vested interest and call JMAC Vendors Advocacy when selling property in Melbourne.